Welcome to the Wednesday Hodgepodge! Please add your link here, only if you're participating in the Hodgepodge! Wishing everyone a safe and happy 4th of July! It's not that I had anything against a winter wedding, its just I always imagined my summer girl would get married in warm weather. As we were trying to pin down a date I prayed God would wrestle the calendar from my tightly held grip and take command of the calendar. Daughter1 and her groom will have a winter wedding, and I am absolutely loving all the possibilities. I love the elegance and the twinkle lights and the no humidity and the fact that its less common so feels a little bit original and so much more. At one point we thought we might have to push the date out to next summer, and I was actually disappointed to think about giving up the winter theme. So glad it all worked out to keep it there! 2. It's Independence week in the US of A! What's your favorite thing about America right this very minute? Favorites only! Let's hear what you love about America! Okay, I'll play along...stripes if we're talking clothing, but stars if we're talking Christmas-ha! Watermelon, but I wouldn't turn down any of those last three! I think the expression is normally associated with a bonk to the head and thankfully I haven't done that in quite a while. Hmmm...these type questions always tax the brain a little, don't they? I'm going with 'lots of bells and whistles' which is loosely defined as things not necessary, but that make something more exciting. We're deep into the wedding planning round here, and really the only thing necessary is a bride, groom, and officiant, right? Except we want lots of bells and whistles! Not literally, but details help make the day more memorable I think, and they're the fun part of the planning. 6. Are you caught up in World Cup Fever? Have you watched a lot, a little or none at all? Definitely! I don't always find 'futbol' exciting to watch, but there have been so many last second wins (and losses, sigh) in this series it has been fun tuning in. We became real fans living in the UK, plus Team USA's star (Clint Dempsey) went to the same small uni as my girls, so we love rooting for him to do well. Such a tough loss yesterday! 7. Bid farewell to June in ten words or less. Over already? Huh? Wait, what? It's July??? Love your 180! You're a good mama for letting go and letting God... and the wedding will be amazing! 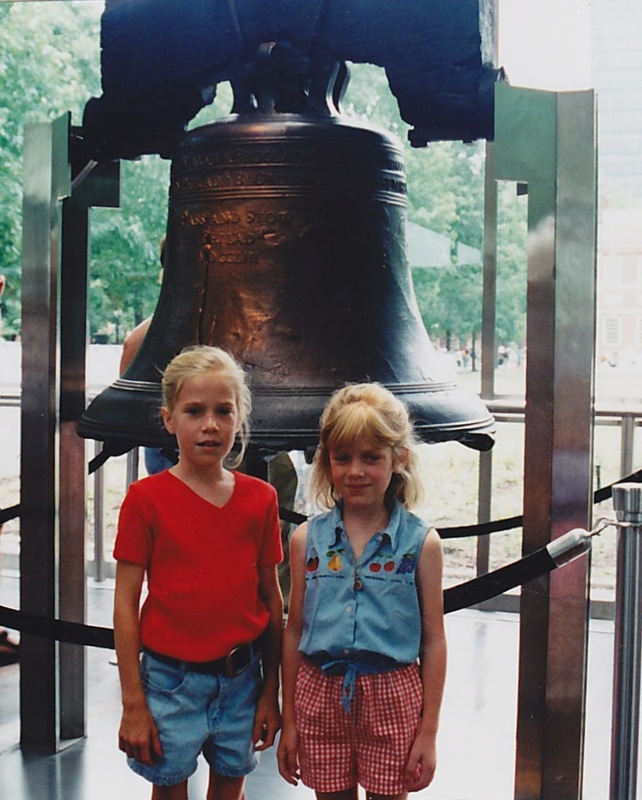 What a cute photo of your daughters by the Liberty Bell. I have a photo of myself in front but i can't find it right now. Anyway have a happy 4th of July!! I'm partial to winter wedding, being a barely-post-Christmas bride myself. I loved the gently falling snow that kindly waited until after the ceremony to start, and then made for a tres romantique kissing picture at the getaway car. Winter weddings seem more memorable. Men can wear suits and actually keep their jackets on without burning up (I love formalwear!). And a honeymoon to a warm place is all that more exciting if you can swing it. We couldn't (we went to West Va which is "almost heaven") but then again, who needs "place" for excitement on a honeymoon??? I think that a winter wedding, especially in the part of winter where we're not yet sick to death of the snow, sounds lovely. Like Zoanna said, the 'gently falling snow' is a lovely touch, and all the little twinkle lights and fires in the stoves. Have a fun time planning. 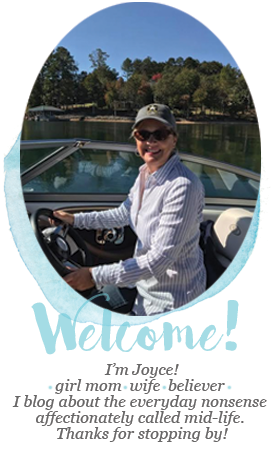 Thanks again for hosting, Joyce, and for adding the Thomas Paine quotation at the end. Ohhhhhhhhhh, the possibilities of a winter wedding would be like a trip out of fantasy world!! Glistening snowflakes...gently falling snow...touching the bride's lips as they kiss for the first time as a wedded couple...the frosty, icy blues for the bridesmaids...I could go on and on. Winter weddings are lovely. June did go by too fast! We are heading down to Charleston later today with the bride & groom to get engagement pictures taken. A friend of theirs is a photographer and does lots of weddings. He knows all the great spots in C-town for shots, and as you know, there are LOTS of great spots there! We figure we will use one for the "Save the Date" card. Love your 180! I am a huge fan of the winter wedding. Great pic of the girls in front of the Liberty Bell. Great questions this week. I am not a fan of winter weddings either. I cater on the side and they are stressful....but have done many and they are beautiful. Especially when the trees are up in the church and poinsettias are placed. Oooooh. A winter wedding! I like it. You can choose richer, bolder colors and yes - the hair will stay put. I think a winter wedding will be beautiful...so many possibilities! I know how much fun you're having with all the planning and such. What a cute picture of your girls. Why do they have to grow up? Great photo of the girls with the Liberty Bell!! So darn cute, those two! I've been following Shannon's blog and am getting caught up in the excitement of the January wedding! I'm already looking forward to photos! 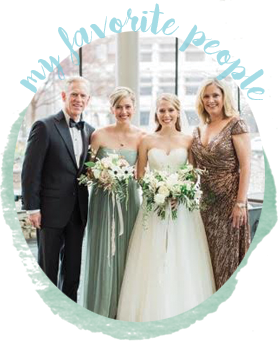 My 3 children had their weddings in a different season. My oldest daughter was Spring, my son was winter and my youngest daughter was Fall. Different themes and wonderful memories. I am sure your daughter's will be spectacular. DH and I married a week before Christmas, and while in hindsight, I wish we would have chosen earlier in December, it was awesome to decorate with poinsettias, pine roping, twinkling lights, etc. Of course, it was a second wedding for me, so it was low-key ... but pretty, I thought. The winter wedding sounds beautiful. I was married in Feb. and had white candles and a few lights. The weather was the big topic of conversation. It got up to 71° and the sun shone bright. A blessing for sure. I've never been to see the Liberty Bell, but I bet Philadelphia would be a great place to visit. I can't wait to see the pictures from the wedding. Glad your wedding plans aremoving along! You post that little thing in the beginning all the time, who the heck is just joining up and not really participating??? ?I can't even! Ding dongs! Glad it all worked out with the wedding date. I'm excited to see how it all comes together. I agree you definitely have bells and whistles going on in your life! Sweet picture of the girls by the Liberty Bell. I'm not a big fan of winter weddings unless they're in a place like Hawaii, San Diego or someplace that really doesn't have a winter. SWMBO and I were stationed in the UK back in the 70's but never caught the soccer bug. I really need to join in on the Hodgepodge. One day I will get my act together. I know I will be seeing stars when there are wedding bells going off in our house. My girls believe in every bell and whistle possible - thanks to me! Both of my aunts had winter weddings when I was a little girl. I was a flower girl for both of them. All I can remember is the snow being so deep all of the females in the wedding party were carried through the snow to the reception hall next door. It's interesting and fun to hear about the wedding plans :) I agree that a winter wedding is special. Mr.4444 and I got married in March, but December would be really cool, I think!